Russia launched a navigation satellite called Glonass-M on Nov. 3, 2018. Over the weekend, Russia completed its second successful Soyuz launch since the Oct. 11 failed crew launch, with liftoff taking place on Saturday (Nov. 3) at 11:17 p.m. local time (4:17 p.m. EDT, 2017 GMT). 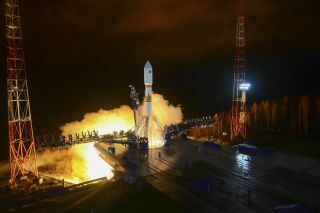 The launch, from a pad at Plesetsk Cosmodrome located about 500 miles (800 kilometers) north of Moscow, put a navigation satellite called Glonass-M into orbit. A Soyuz-2.1b rocket was used during the launch — the same model as in Russia's most recent launch, and a variation on the model used for crewed flights, including the Oct. 11 failure. According to a statement released by Russian space agency Roscosmos, the satellite deployed successfully after launch and began communicating normally with Earth. The launch came just a few days after Roscosmos completed an investigation into the Oct. 11 failed launch, which sent a NASA astronaut and a Russian cosmonaut plummeting to the ground. The investigation found that the abort was triggered when a faulty sensor caused a strap-on booster to separate incorrectly and hit the main booster. Roscosmos has said that its next flight of the rocket model that failed, the Soyuz-FG, will occur on Nov. 16 during a cargo launch to the International Space Station in preparation for the system's return to crewed flights on Dec. 3. Editor's Note: This article was corrected to clarify the statement from Roscosmos.